Radiation is the weirdest and, so far, easiest of the big three of cancer treatments. I don’t get sick like I did with chemo. And it doesn’t hurt, like the double mastectomy did. But unlike the others, I worry about the longterm impacts of radiation exposure – and I’m starting to feel the effects of the beams. I go five days a week and have completed the first of what I expect will be six weeks. They say I will eventually feel as if I am suffering extreme sunburn, and that I will be really, really tired. I already feel slightly sunburned and pretty tired. It came on suddenly. I was trying to walk every day to build my strength and suddenly this weekend – bam! My legs feel like lead. In fact, when I walk I feel like I am wearing one of those heavy aprons one wears to avoid radiation exposure while getting dental Xrays. I go to Fresno Cancer Center every weekday morning. Several of us are on the same schedule, so it’s nice to see familiar faces in the office every day. It takes about 30 minutes for me to get through the process – far longer than the others, who seem to zip in and out. But I get five exposures, and each must be carefully calibrated to make sure it’s in exactly the right spot. The zaps go to the front and back of my right clavicle, in each direction along my right breast scar and in the middle of my breast bone. As I showed you before, my chest is marked with a felt-tipped pen. I also received my first tattoos last week – small but permanent ink dots that are used to line up the lasers that point the radiation machine to the right place. The technicians are very careful and the work is tedious. Their goal is to hit the places any cancer cells could be lurking that survived the chemo –without hitting lung tissue. 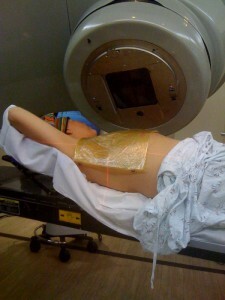 Once a week they take new Xrays to make sure my body hasn’t changed – either from the radiation or from weight loss or gain. It’s a very precise process that involves geometry (which I thought was good only for shooting pool) and trigonometry (whose practical applications have escaped me from 10th grade until now). Michelle went with me this morning and was able to come into the room as they lined me up. They explained the process, then they all hustled out to watch on the monitors as the big radiation-proof metal door eased shut, locking me alone inside. Only five more weeks to go! The red laser lights are to help line up the machine. 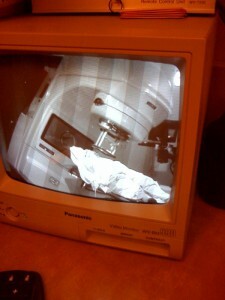 This is what it looks like viewing from the monitor safely outside the radiation room. So glad there are skilled technicians who paid attention during math class! I am constantly overwhelmed by your honesty, courage, and determination. Stay strong, my friend.